When I was a wee lad, which is a long time ago now, my first ever love affair was with the League of Ireland. Not too many people would make this confession in public, or in print, especially after the mature reflection made possible through the passing of several decades, without the fear of having to wear one of those curious jackets that tie at the back. But that’s the truth of it anyway, and nothing has changed since; I am still hopelessly in love with the League of Ireland. I loved the football, naturally enough, and growing up in Turner’s Cross meant that I was blessed to have it right on my own doorstep. But there was so much more to love than just the matches or the colourful cast of characters that bestrode them; LOI football was – and remains, in my view – irresistibly quirky. Cork Celtic was my team back then, long before Cork City was ever even dreamed of. Celtic had a central defender in the ‘70s called John McCarthy. John was known as The Postman. This was not a heroic title, however, as it would be in England, say, or Italy where it would signify his unfailing ability to deliver the goods. No, John McCarthy was known as The Postman because he was, well, a postman in real life. He usually delivered the goods on the pitch as well, to be fair. And of course there were others, such as Jerry ‘Mala’ Myers. I often wondered if he was a mala in real life, or what a mala might be. It was all very curious and quirky. Celtic were amazing, when I followed them: brimful of contradictions and relentlessly exasperating, as any true lover should be. The club always seemed to be sellotaped together, invariably snatching defeat from the jaws of victory. Yet Celtic won a league title in style after losing 7:0 against Bohemians and subsequently attracted the incomparable George Best to its ranks, albeit briefly. Today’s equivalent would be Ronaldo or Messi signing for City at the age of 26 or 27: that’s not an exaggeration, either - just think about that for a moment. It wasn’t just George Best, though; Celtic also bagged the only player ever to net a World Cup final hat-trick, Geoff Hurst. Not content with that, they also signed West Germany’s most legendary (pre-Muller) striker – Uwe Seeler, who had lined out against Hurst in that famous 1966 decider at Wembley. And for good measure Bobby Tambling, Chelsea’s all-time leading scorer, wore Celtic’s colours for a few seasons and managed them too. That was the Celtic I knew and adored – barely able to pay the electricity bills, but capable of luring the game’s greatest names to Turner’s Cross. Now that is fairly hard-to-beat quirky, by any measure. The League was relatively steady way back then, for a few years at least. Grounds, of course, were appalling pretty much everywhere but save for the loss of Drumcondra in ’72, membership was the same each season and nobody was tinkering with top six/bottom six experiments, thinking of forming a second division, planting teams in Kilkenny, Wexford or Monaghan, or inventing play-offs. Life was simple. We stood on grassy banks in the sunshine, unless it rained and then we stood drenched on treacherous, slippery grassy banks. But we were young and didn’t care and I soaked up regular doses of quirkiness book-ended by Celtic’s swagger, incompetence, character and colour. Then, in the mid-70s, Athlone Town quite unexpectedly provided a brilliant example – possibly unsurpassed – of League of Ireland quirkiness. 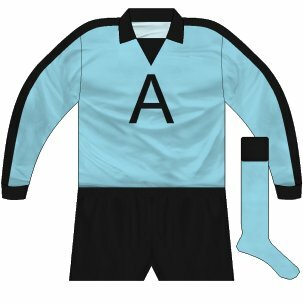 In 1974-75, a time before sponsors’ names on football shirts were heard of never mind commonplace, Athlone Town wore (very pale) sky-blue jerseys bearing a large ‘A’ on the front. LOI football shirts were plain as plain could be till Athlone changed everything with their unprecedented, wackily courageous move. Numbers on the back, or an occasional crest: that was it for football shirts in Ireland up to then. Later, in January 1976, Kettering Town attempted to become the first British club to carry a sponsor’s name – Kettering Tyres, it was, anoraks – but the English FA, in a combination of shock, outrage and a tut-tutting overload, banned the club’s efforts. Athlone, however, had confidently promoted the letter ‘A’ all over Ireland, free from nasty FA interference, well before that. Still, you’d have to wonder, why? Like, why ‘A’? Was there a company in Athlone called ‘A’? Or possibly ‘A1’ - did someone just run out of 1’s? Or did the Midlanders refuse to accept the ‘1’, claiming it had not been included in the original deal? Was it a way of escaping a fine, to carry an abbreviation rather than an entire company logo? Bizarre! Baffling! Quirky! Maybe an Athlone director had been influenced by some hit US teen movie where college sweaters with ‘G’ or ‘W’ or ‘S’ were de riguer? Or were Athlone, in fact, the actual (but not credited) inspiration for the American action/adventure TV series, The A-Team? One way or another, it’s a riddle unsolved to this very day: The Great Athlone Town Shirt Mystery. Of course, you can’t ask the club’s commercial manager of the time, so you can’t, as commercial managers weren’t invented until the 1980s. Athlone’s trail-blazing capital letter trend didn’t catch on, sadly, so we never witnessed Bohemians proudly sporting a bold ‘B’ or Dundalk a defiant ‘D’ or Harps a flowery ‘F’. As a result of Town’s pioneering work, however, ‘A’ became the most instantly recognisable alphabetical unit to LOI fans everywhere that season. 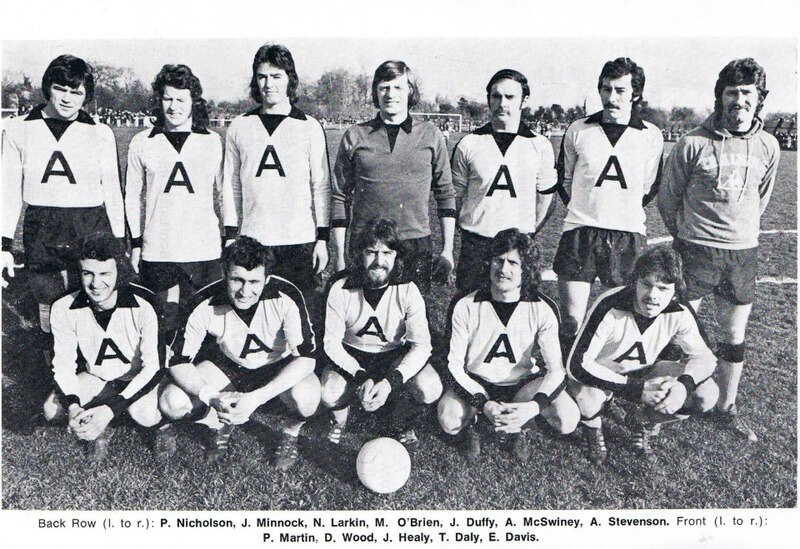 You knew your ‘A’s’ when you saw one, so you did and if you didn’t, you couldn’t fault Athlone Town for it. I quite liked that groundbreaking Athlone shirt – can you imagine the collector’s item it would be today? It was quirky. It epitomised the League for me. We were delighted when Gerry Desmond, possessor of the most knowledge about the Cork City's history and a former programme editor, whose input has been vital to this site, got in touch with an article he had written about an old Athlone Town jersey, which we are happy to reproduce. Thanks also to Athlone CEO and former City chairman John O'Sullivan, who provided the team picture. Take it away, Gerry. And some decent players ran out bearing those ‘A’ shirts – Karl Humphries, a gifted Cork lad who had previously played with Hibs and Celtic, was one. Then there was Johnny ‘Minno’ Minnock, another class act. Others that I can easily recall even now were Dougie Wood, Noel Larkin, Terry Daly and lunatic goalkeeper Mick O’Brien. In case the former custodian’s legal team gets to read this, the term ‘lunatic’ is used only to reference his cat-like agility, unquestioned bravery and obsessive hatred of Oriel Park crossbars. This was also the era of long hair and moustaches, though that has little to do with my tale really. The following season Athlone somewhat rashly discarded their could-be-cult ‘A’ shirts, opting to change to their by now traditional blue-and-black stripes. This proved a colossal mistake, in my humble opinion, as Athlone, in the wake of the confusion caused to successive opponents faced with ten chests (lunatic goalkeeper exempted) emblazoned with giant ‘A’s’, had qualified for the UEFA Cup. That’s just my theory; several football historians believe the Midlanders had a really good team that season. The Town soon created a slice of history, nonetheless, with their new ‘A’-less, striped shirts, becoming the first LOI club ever to win its debut European tie on aggregate. Norwegian club Valerengens – as they were known then – were comfortably put to the sword to set up an unbelievable pairing with mighty AC Milan in the second round (no bloody ridiculous qualifiers or seeding in those happy, carefree, quirky days!). But this is the point where those mystifying shirts could have sealed the most famous result in Irish football history, had they been retained. This is exactly where the fateful decision to dump the ‘A’ shirts finally came home to roost. Much has been written down through the years about Athlone’s scoreless victory over the Italian aristocrats at St Mel’s. ‘Minno’ even squandered a penalty kick, trickling a faint effort into Albertosi’s arms, but the Town were far from flattered by their 0:0 win. However, I firmly believe that Athlone could have put the entire tie beyond all doubt in that first leg, had they been brave enough to resurrect the ‘A’ shirts for the occasion. Can you imagine the Milanese confusion? Already ill-at-ease due to St Mel’s rusting corrugated iron, strong smells of fresh paint and brillo in the dressing room, and six-inch layer of mud, they would have spent the ninety minutes wondering just what the hell the ‘A’ thing was all about. Was it a half-hearted ‘AC’ tribute, for instance? Or, were these Irish upstarts attempting to insult Serie A? “Che cos’é?” Romeo Benetti would have asked himself, arms in supplication, each time Humphries sped past. “Non lo credo!” Nereo Rocco would have exclaimed from the matchbox-sized dugout, bemused, as his team reeled before his eyes. Instead, AC simply pretended that Athlone, as Inter-lookalikes, were the dark enemy and drew inspiration from that to claim the tie with late, late goals at the San Siro. It may seem a silly notion today with advertising everywhere you look, but I remain convinced that Athlone could have easily chalked up a 3-0 or even 4-0 win on the strength of those quirky, mysterious shirts playing on the suspicions and superstitions rattling around fragile Italian minds on a mucky, windswept, uncomfortable pitch. Nobody will ever persuade me otherwise.